Account, inbox and personal groups are set to appear as the default Small Links. 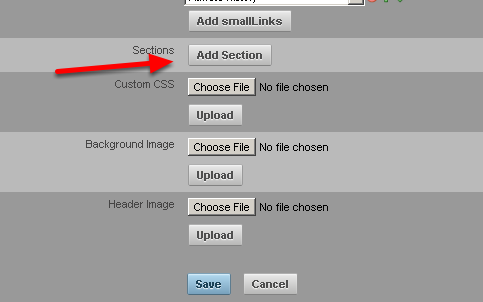 From the Small Links dropdown list, select the Module that you want to appear on the far right of the small Links area on the site. 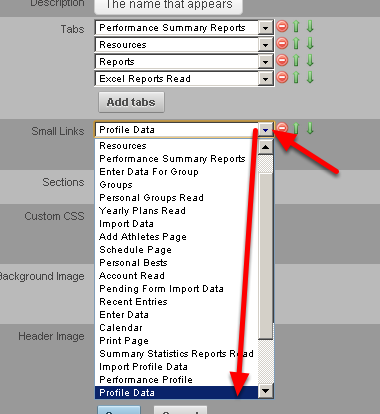 The example here shows that "Profile Data" was selected to appear as the first Small Link. The image in the step below shows you how the application looks with only this Small Link Module set up. N.B. Because the Account Module does not appear as a small link any more, you must enable the Account Module on a Tab or as a Button in a Section, or a User will not be able to access their account information! Add in as many Small Links as you require on the Small Links List. 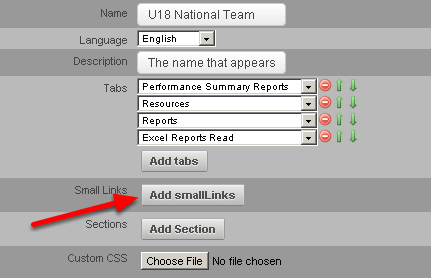 Click on the "Add smalllinks" to add in a new Small Link and then select from the drop down list. 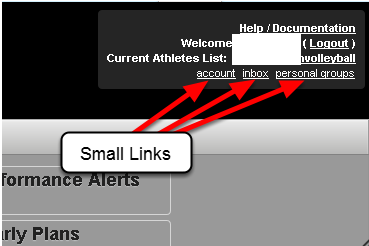 Choose the Small Links that you think the professionals or athletes require. 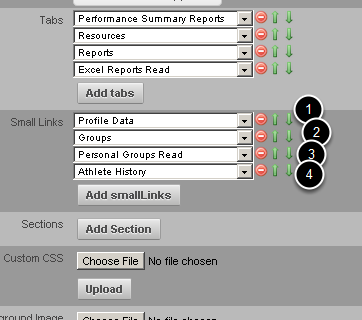 The example here shows that four Small Links have been selected. Aim for 3-4 Small Links to ensure the page does not look too cluttered. -Move the Small Links up or down using the green up and down arrows and this will move them left to right on the actual site. N.B. The Module at the top of the Small Links list will appear on the left of the small links area on the Site and the Module at the bottom of the Small Links list will appear on the right of the small links area on the site. -To Delete a Small Link, click on the red delete button. If you add in a lot of Small Links, the Site can look cluttered! Try to avoid this.